Career Coaching is an interactive process that explores work-related issues, leading to effective action. The coach acts as both a catalyst and facilitator of individual development and transformation, thus increasing organizational development and transformation. Career coaches connect people with their passion, purpose, values and other critical aspects of their ideal work. They equip their clients with career management skills that can be used in future transitions, in addition to enhancing their current work. They also facilitate their clients' process of developing and implementing a job search or business start-up plan to activate their Authentic VocationT. The desired outcomes of Career Coaching include enhanced self-awareness, clarity about life purpose & goals, increased self-management and improved quality of life. Connect clients with a deeper level of motivation than "just a job." Clients discover their passion and purpose to guide their decisions, empowering them to choose work they love, make a good living, and still have a balanced life. Distinguish themselves from career counselors and consultants by facilitating clients' development of career management skills, which enable clients to navigate present and future transitions. Probe for deeper levels of motivation that, when addressed, can cause a lasting QuantumShift!T rather than providing just a "quick fix." Create effective coaching interactions by listening, providing feedback, asking powerful questions, observing, and modeling. Remove blocks to career progress, such as self- limiting beliefs, incomplete awareness of marketable skills and lack of purpose. Improve clients' ability to market and sell themselves in the job market regardless of economic conditions. Increase individual potential for career growth and future earning power. Assist clients in becoming "career self-reliant," taking control and ownership of their own career development. Enhance clients' job satisfaction through the discovery of their Authentic VocationT. Help clients effectively manage change and transition. Enable clients to achieve their desired balance between work and personal life. Have you been feeling restless or discontented in your job? Like something is missing, but you don't know what? The key may be a whole new approach to career development: Authentic Vocation. Life purpose. What is the purpose or mission of your life that must be expressed through your work? Values. What values must be expressed in your work and life for optimal satisfaction? Motivators and interests. What motivates you to do something well? Knowledge, skills, and abilities. Which of these do you have that you want to continue using? Work and other experience. What experience can you leverage in your next position? Job/career targets. What job titles and/or industries would suit your goals? Work environment. What location, culture, and other workplace factors would be critical in your ideal work environment? Business reality. Is your target financially viable? Can you make a living at it? If not, what needs to be adjusted so that you can? 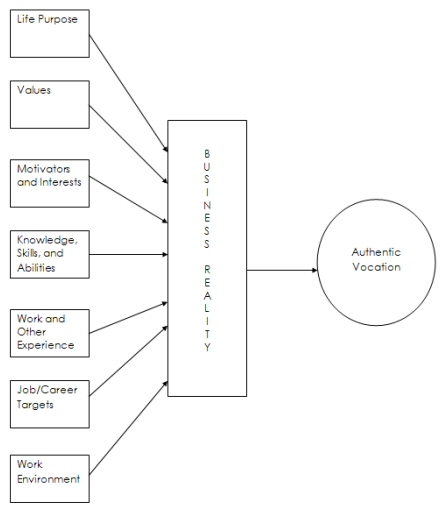 The diagram below illustrates how the first seven factors form the template, which must be filtered through the eighth factor, business reality, to give you a true Authentic Vocation. If you are seeking greater fulfillment at a job that also meets your financial needs and allows you to "have a life," then Authentic Vocation coaching may be for you. To get results and to learn more about how to enhance your personal and/or organizational capability, please call for more information. Your initial telephone consultation is free. Hot off the Press - Another Great Review!